I've been a little short on time the past few weeks - so I worked on my project during many stolen minutes forgetting to have my camera available in my craft room to record my fits and starts of creation. I also am definitely NOT best friends with my brayer, and I didn't even try to get full coverage on any surface I used it on. 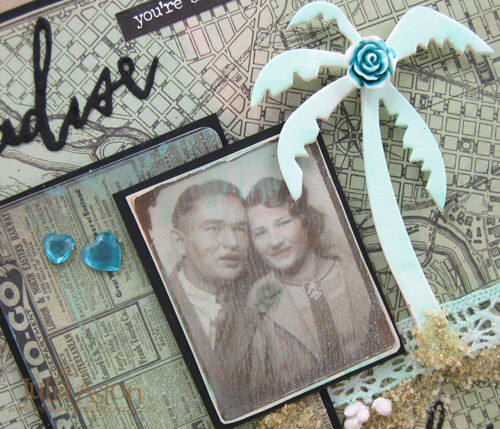 4. a palm tree cut from Tims's new Village Surf Shack Sizzix Die. I colored some Mirrored Stars and an Heirloom Rose with Aqua Adirondack Alcohol Ink. I added a little color to the Photo Booth photo using Spun Sugar and Cracked Pistachio Distress Markers. You can see the brayered paint wash on the photo. 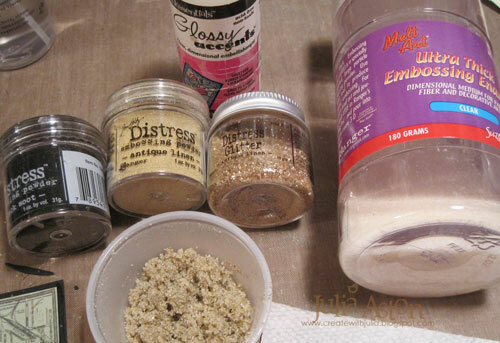 I made the best sand ever using Tim's recipe from his July 2014 tag - mixing Clear UTEE, Antique Linen and Black Soot Embossing Powders, Antique Linen Distress Glitter and Glossy Accents. LOVE, LOVE, LOVE this realistic looking sand! After you mix the ingredients - you put Glossy Accents on the surface where you want the sand - then spread the sand over it and let dry! 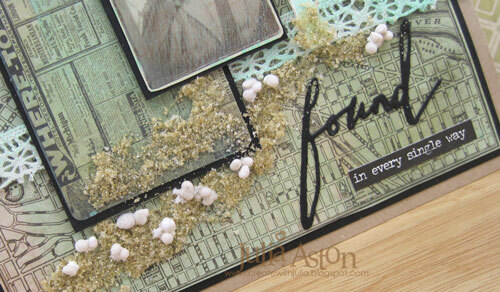 I also added some White Art Stones from Prima for added visual interest and dimension with the sand. I die cut Paradise and found using Thinlits Handwritten Vacation dies and added a Small Talk sticker that I cut in half putting half at the top of the card and half at the bottom. I stapled a piece of Trimmings Lace onto the card base - giving the suggestion of the ocean's edge. All the pieces are popped up on foam dots. I hope you have enjoyed your stop at Terminal 1 today and invite you to stop by the station again next Monday to see who will be creating with the contents of our travel bag at Terminal 2! 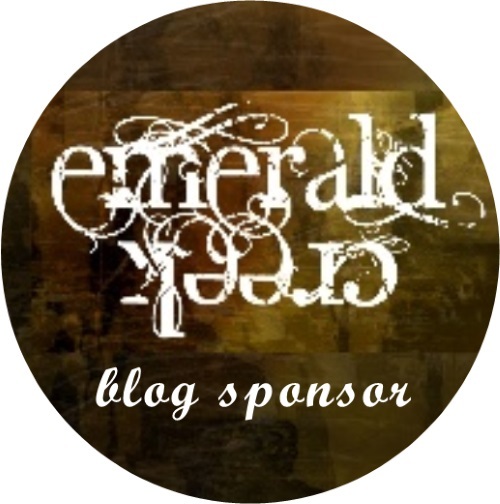 In the meantime - please join us in our July Challenge - Monochromatic. 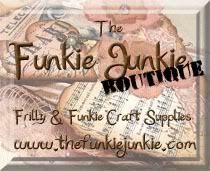 There's a $25 gift certificate from Funkie Junkie Boutique to be won by a random entry! I'm actually going to link up this card since I just realized it fits the challenge!! Paper: Black, Kraft - Papertrey Ink, White Little Sizzles Matboard - Sizzix, Tim Holtz Paperstash/Dapper. Accessories: Ranger Distress Paint Cracked Pistachio, Breyer, water spritzer, Idea-ology Small Talk, Trimmings Lace, Photo Booth, Pocket Cards, Mirrored Hearts, Heirloom Rose, Fine Tip Glue Pen - SU, Adirondack Alcohol Ink Aqua, Ranger Distress Markers Spun Sugar, Cracked Pistachio, White Art Stones - Prima, Clear UTEE, Antique Linen and Black Soot Embossing Powders - Ranger, Antique Linen Distress Glitter - Ranger, Mini Attacher - Ranger, foam dots, Thinlits Handwritten Vacation Dies, Sizzix Village Surf Shack Die. Stunning! Julia .Such beautiful colours, the texture of the sand, your chosen elements, the design and composition -just everything about it makes for a truly beautiful card! 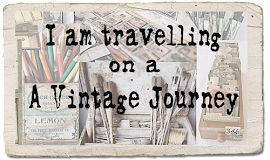 You have definitely got this months Destination Inspiration off to a superb start . Thank you for sharing and certainly inspiring . Beautiful use of the travel bag contents! Of course, the teal/turquise is a favorite of mine from the start, but I particularly love it on those mirrored hearts and Cracked Pistachio brayered over the map and ephemera, lace and (squeal!) the palm tree! Great job on the sand, too! Hugs! wonderful recipe for sand! thanks so much for sharing! wonderful card! This is gorgeous, I love the design. 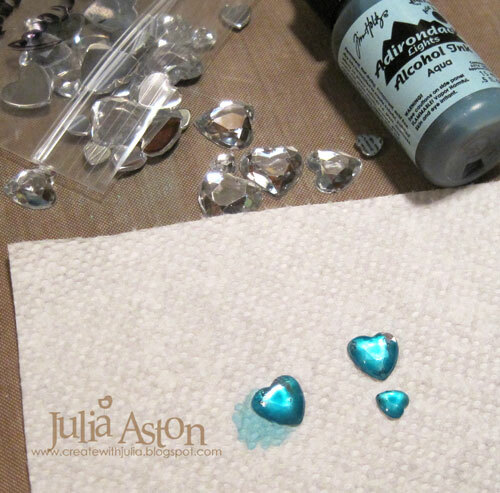 Really fabulous and what a wonderful tutorial!! Brilliant use of the ingredients, really love the combination of the textural sand with the other elements. Fantastic composition too!! 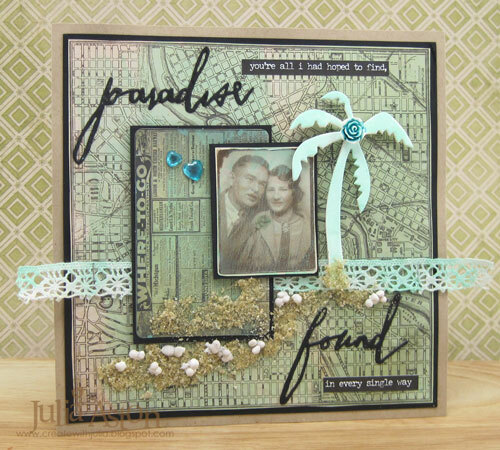 Oh, Julia, this is absolutely charming - I just love the sandy texture and those teal jewelled accents, and the whole thing works beautifully. Julia, this is totally beautiful! Stunning design!